It's not every day the government shows up to your house to seize your breakfast, but that is exactly what happened to a Keperra resident named Neti Moffitt. The incident began when Moffitt cut up the orange Tuesday to give to her two-year-old as a snack. She bought the orange from Brisbane and it seemed like a normal fruit. Her son ate some of the oranges and the remaining slices were left out on the kitchen counter overnight. The next morning, Moffitt woke up to find the remaining orange that was left out had turned purple. "It looks like someone's dipped it on an ink pad, which I guarantee you we haven't," she said. "I went rifling through the rubbish bin for the three bits eaten by my son, and sure enough they were more-so purple than the ones left out on the bench," Moffitt continued. "My first thought was I hope it has had no ill effect on my child. But he's fine, absolutely not a drama." 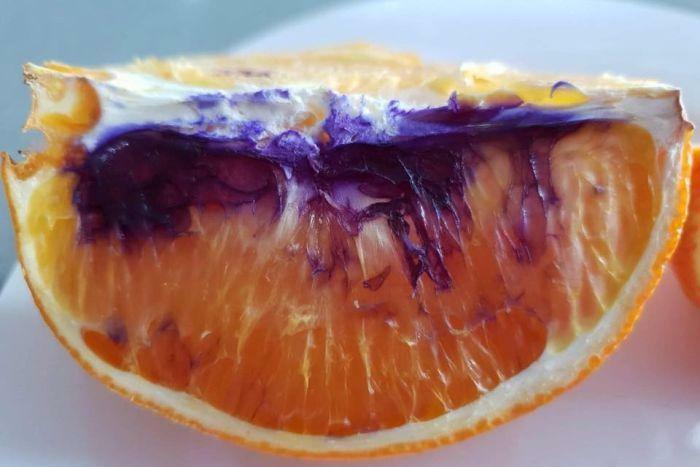 She began searching the internet for answers where she found only one other instance of an orange turning purple, coincidentally it was also in Queensland in 2015. In 2015, Nine News reported several cases of oranges purchased at Chinchilla in the Western Downs had turned purple. Forensic testing ruled out the possibility that the oranges were artificially colored. Moffitt decided to reach out to Queensland Health for answers and they sent out an agent immediately. "The gentleman who came to collect it was very, very excited," she said. "He was aware of the case three years ago, and he'd spoken to the chemist who tested the orange three years ago and said 'look, I think we've got another one'." The agent from Queensland Health confiscated the orange as well as the knife used to cut the fruit. He even took the steel knife sharpener that was recently used to sharpen the knife used to slice the orange. "There's only one other case that's been reported. I posted it on Facebook and everyone has their own speculation to what it could be … but no-one's in a field where they have any scientific proof or evidence," Moffitt continued. "If it's some kind of weird acid-loving mold or iodine reaction to the knife, wouldn't that information be well known?" "I'm so keen to find out what has happened," she said. The purple orange was one of many that she purchased last week. "The orange also leaked some purple onto the vine of a lemon I had cut open in the fruit vine," Moffitt said. "So they took that also. They were really curious about the fruit trees we have in our garden. I also have a bunch of roses beside the fruit bowl, so they took that into consideration. But they're baffled, they're absolutely stumped. No-one knows what caused it." A spokeswoman for Queensland Health confirmed, "The items have been taken to Queensland Health Forensic and Scientific Services for testing."